At the dawn of history the ancient Thraciansa group of tribes speaking an Indo-European languageextended as far west as the Adriatic Sea, but they were pushed eastward (c.1300 B.C.) by the Illyrians, and in the 5th cent. B.C. they lost their land west of the Struma (Strimn) River to Macedon. In the north, however, Thrace at that period still extended to the Danube. Unlike the Macedonians, the Thracians did not absorb Greek culture, and their tribes formed separate petty kingdoms. The Thracian Bronze Age was similar to that of Mycenaean Greece, and the Thracians had developed high forms of music and poetry, but their savage warfare led the Greeks to consider them barbarians. Many Greek coloniese.g., Byzantium on the Hellespont and Tomi (modern Constana) on the Black Seawere founded in Thrace by c.600 B.C. The Greeks exploited Thracian gold and silver mines, and they recruited Thracians for their infantry. Thrace was reduced to vassalage by Persia from c.512 B.C. to 479 B.C., and Persian customs were introduced. Thrace was united as a kingdom under the chieftain Sitalces, who aided Athens during the Peloponnesian War, but after his death (428 B.C.) the state again broke up. By 342 B.C. all Thrace was held by Philip II of Macedon, and after 323 B.C. most of the country was in the hands of Lysimachus. It fell apart once more after Lysimachus death (281 B.C. ), and it was conquered by the Romans late in the 1st cent. B.C. Emperor Claudius created (A.D. 46) the province of Thrace, comprising the territory south of the Balkans; the remainder was incorporated into Moesia. The chief centers of Roman Thrace were Sardica (modern Sofia), Philippopolis (Plovdiv), and Adrianople (Edirne). The region benefited greatly from Roman rule, but from the barbarian invasions of the 3d cent. A.D. until modern times it was almost continuously a battleground. The northern section passed (7th cent.) to the Bulgarians; the southern section remained in the Byzantine Empire, but it was largely conquered (13th cent.) by the second Bulgarian empire after a brief period under the Latin Empire of Constantinople. In 1361 the Ottoman Turks took Adrianople, and in 1453, after the fall of Constantinople, all of Thrace fell to the Turks. The Thracian language was the language of the ancient population of the modern Thracia and several adjacent regions. The newest studies point out that, besides Thracia, Thracian was also spoken to the west of the Ossogovo mountain, along the upper course of the Bregalnica river and further to the west of the lower course of the river Vardar (Axios) including the modern city of Thessalonica and its environs. The northern branches of the Balkan mountains (approximately to the south of the line Montana Devnja) probably also belonged to the Thracian linguistic territory. The ancient name of the city of Varna Odessos is not Thracian, however, therefore in Varna and its environs was spoken another language - the Dacian. The Thracians had no literacy which hinders significantly the study of their language. Some words of their language were transcribed with Greek and Latin letters. Even before the coming of the Slavs a significant number of Thracians were Hellenised or Romanized, especially in the towns. It is difficult to determine when the Thracian language disappeared. Jordanes in his Gothic history, written in the middle of the VI-th c. provides one of the final accounts. Thus, speaking about the Danube river, he informs us that this river is called Ister in the language of the Bessi (a Thracian tribe): Qui [=Danubius] lingua Bessorum Hister vocatur. It is accepted that lingua Bessorum for him and his contemporaries meant the language of the Thracians. An interesting and not completely resolved problem is the survival of Thracian words in the language of the Bulgarian Slavs. Such are river names: Iskr, Panega, Osm, Etr (Jantra), Ibr (the upper course of Marica), Marica, Strjama, Tundzha, Arda, Struma, Nestenica (Mestas tributary), Bregalnica; names of mountains: Ossogovo and Rhodopes. 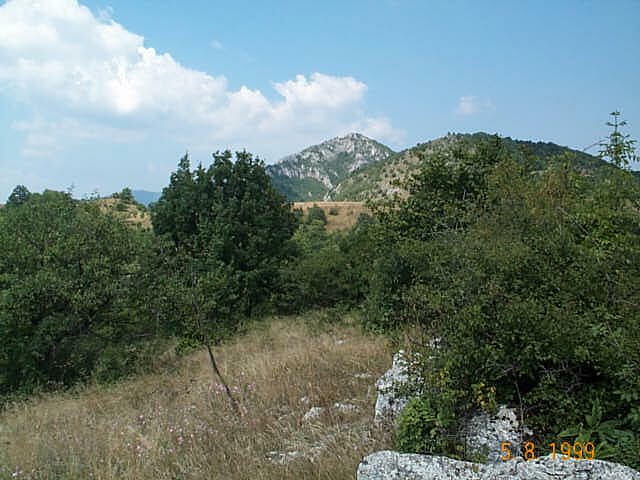 The ancient name of the Balkan mountains Hemus, has survived in the rare form of Im(-planina). Thracian are also the names of some settlements: Nessebr, Plovdiv, Silivrija (transmitted via the Greek), etc. There are reasons to believe that Thracian are also some geographical names, which were not attested in the ancient sources: Vleka (a river), Nsla (a village, named after the neighbouring river), Batkun (a village near the town of Pazardzhik), Pirdop, etc. A number of words in the modern Bulgarian are also Thracian in origin, although there are no special studies on this question up to now. The study of the morphology and syntax of one language, however, requires texts long enough. Unfortunately, the longest text in Thracian is an inscription, consisting of 8 lines (61 letters), engraved on a golden ring. There are ambiguities in reading this text. The other inscriptions, most of them very short, also do not allow the drawing of more definitive conclusions about the grammatical system of the Thracian language. 1. Words, attested in the ancient sources and in one inscription 23 words altogether. 2. Inscriptions, of which four are most important, while the rest (around 20) are very short. To this list we can add a number of geographical names which, although not occurring in the ancient texts, still belong the pre-Slavic, Thracian layer of the Bulgarian place names. Such limited data explain our fragmentary understanding of the Thracian language (as well as the other paleo-Balkan languages Illyrian, Dacian). Nevertheless, science was able to reconstruct in general terms the phonetics of the Thracian, a part of its vocabulary and also to understand a number of its word-construction patterns. These advances in the last one hundred and twenty years were due to the work of A. Fick, W. Tomaschek, P. Kretschmer, N. Jokl, St. Mladenov, D. Detschew, Vl. Georgiev, V. Beshevliev and others. The comparative studies with the Baltic languages were very helpful in the case of some unclear personal and geographical Thracian names and provided new insights into the Thracian vocabulary. It turned out that the Thracian language is in close genetic links with the Baltic languages. Rhesus was a Homeric king of the Thracians, slain by by the king of Argos, Diomedes, outside Troy. If you want to find your way into the host of the Trojans, there are the Thracians, who have lately come here and lie apart from the others at the far end of the camp; and they have Rhesus son of Eioneus for their king. His horses are the finest and strongest that I have ever seen, they are whiter than snow and fleeter than any wind that blows. His chariot is bedecked with silver and gold, and he has brought his marvellous golden armour, of the rarest workmanship- too splendid for any mortal man to carry, and meet only for the gods. And when I had heard all I wished to learn, I stood still; and I see Rhesus mounted like a god upon his Thracian chariot. Of gold was the yoke that linked the necks of his horses brighter than the snow;  and on his shoulders flashed his shield with figures welded in gold; while a gorgon of bronze like that on the aegis of the goddess was bound upon the front of his horses, ringing out its note of fear with many a bell. The number of his army you could not reckon  to an exact sum, for it was beyond ones comprehension; many knights, many ranks of targeteers, many archers, a great crowd of light-armed troops, arrayed in Thracian garb, to bear them company. Such the man who comes to Troys assistance,  whom the son of Peleus will never escape, either if he tries to escape or if he meets him spear to spear. Thrace (including modern Bulgaria and parts of Greece and Turkey) was a wild region to the north of Greece and Macedonia inhabited by a number of different tribes. Greek colonies were established along the coasts of the Aegean, the Propontis and the Black Sea. Local silver resources and trade with the Greeks resulted in a thriving economy for some of the inland tribes. Coins were issued early in the archaic period of the 6th century BC. For the most part coins attributed to the tribes are scarce but many issues of the Greek colonies in Thrace are easily available to collectors. Thrace is a micronation. A micronation has often been called by many names, but no matter what you call it, the definition does not change. A micronation is usually an online community of individuals interested in the hobby of nation-building. The goals of each micronation vary, because while some micronations may focus on building an online "virtual" nation complete with railroads and television stations. Other examples of micronations are ones that focus on the political side of the hobby, who's attention is held by elections and campaigning, and later by the politicians elected. And finally, there are some micronations that revolve around a simple internet discussion board or forum. Can I have citizenship in another micronation and still join Empire of Thrace? Yes, it is the right of every Thracian citizen under the Constitution to be a part of, or hold dual-citizenship, in another micronation. However, be sure to check with the authorities of your other micronation when joining Thrace. Not everyone is as open minded about dual-citizenship as we are.